It’s hard to imagine that air travel has only been around for about 108 years. Even harder to believe is that in 1900, Wilbur Wright told his brother Orville that “not within a thousand years will man every fly.” But 69 years later, Americans put men on the moon. The air travel that the Wright Brothers began was nothing like what we have today. You were lucky if you made it off the ground and even luckier if you and your plane both landed in one piece. It’s always great to see kids on the second floor of the History Center looking at the display of Fort Wayne aeronautical history. The looks on their faces when they see the propeller… or realize the flimsiness of early airplanes…or model the pilot goggles in the hands-on display case… are priceless and more than a little comical when they try to fathom how truly primitive airplanes were at the beginning of the 20th century. The theme of my blog posts thus far has been in finding ways to make history more alive for children and relate the past to the present. The history of flight lends itself well to this sort of activity. When you’re out on a jaunt to view historical markers (see my late December post), you should venture over to Memorial Park to look at the statue dedicated to Art Smith. Smith was quite the aviation adventurer. Others might say he was the epitome of the thought that there’s a fine line between courage and stupidity. But for Smith it was “no guts, no glory” and also no money to repay the debt he owed his parents for the money they borrowed against their home and property to finance the building of his first airplanes. He had great need to be a success. He also was working to get enough money to finance an ocular procedure for his father, whose construction business had started to “take off” (no pun intended) about the same time that he began to go blind. Rachel Sherwood Roberts wrote a biography of Smith that was excerpted in the Fall, 1998 issue of “Traces of Indiana and Midwestern History”, a publication of the Indiana Historical Society. You can find the article on-line at http://www.airmailpioneers.org/Pilots/AartSmith.htm. The Air Mail Pioneers web site is a wonderful look back to the beginnings of this service of the USPS. Smith was known as “The Smash-Up Kid” in the early days of his career. You can probably guess why. He crashed his plane a number of times but finally made a successful flight from Fort Wayne to New Haven. His nickname changed to “Bird Boy” after that. He flew for shows and exhibitions, once earning $10,000 for two flights at the Texas State Fair. He gained in popularity, becoming a major hit in Japan. The Japanese considered him a god and bestowed a number of medals and honors on him for flights that lasted no more than 10 minutes at most. The History Center has a letter written in blood (not on display due to its fragility) by a Japanese youth begging Smith to take him up for a flight. Smith had a long-standing relationship with Aimee Cour. But his fiancee’s father refused to allow them to marry so they eloped—making an emergency landing and then taking off again-- only to crash land outside Hillsdale, MI. According to Roger Myers, curator of the Fort Wayne Aviation Museum at FWIA, for the past 27 years, Amy’s dress caught on the controls, causing the crash. There was a furniture truck in the area, hauling a load of mattresses. The resourceful driver put the couple on his load and drove them into town where they were married later that day side by side as they recovered from their injuries. 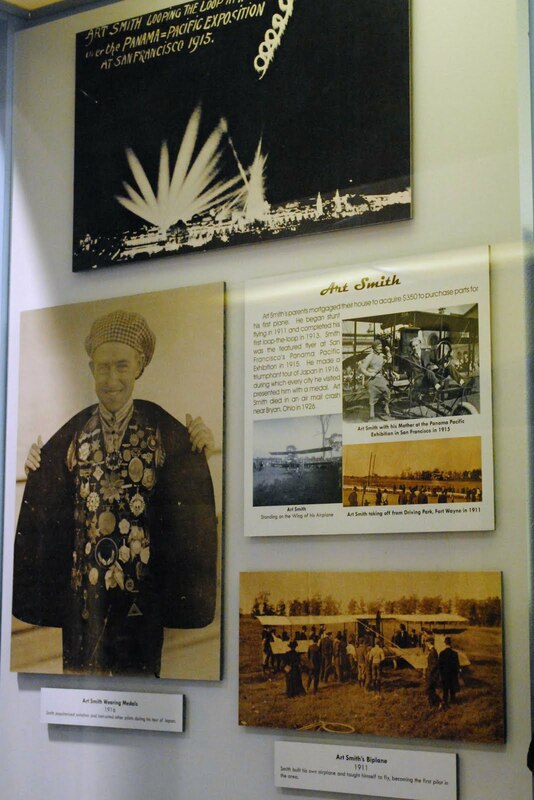 The airport’s museum has a photo of the wedding on display and a replica of Smith’s plane hangs over the airport’s atrium. Smith continued flying but his work took a toll on the marriage and eventually he and his bride divorced. Headlines of the day, according to Myers, accused him of having a swelled head and Smith claimed to have seen Aimee in the company of another man. He continued his career as a flight instructor during World War I. Accounts vary as to why he was rejected for military service but the most common are that he was a. too short or b. crashed too often. After the war Smith joined the US Air Mail Service and flew the Chicago to Cleveland route. He was killed in a crash on February 12,1926 near Montpelier, OH after encountering fog and ice between Waterloo, IN and Bryan, OH. If your children enjoy flying, a trip to Smith’s statue in Memorial Park is the first stop on a day devoted to airline travel. The monument was designed by James Novelli and is a 40-foot shaft of Vermont granite topped by a young man standing on a globe, face to the sky, with wings and a flying ace’s helmet. Then come on over to the History Center to look at the aviation display and check out the books. 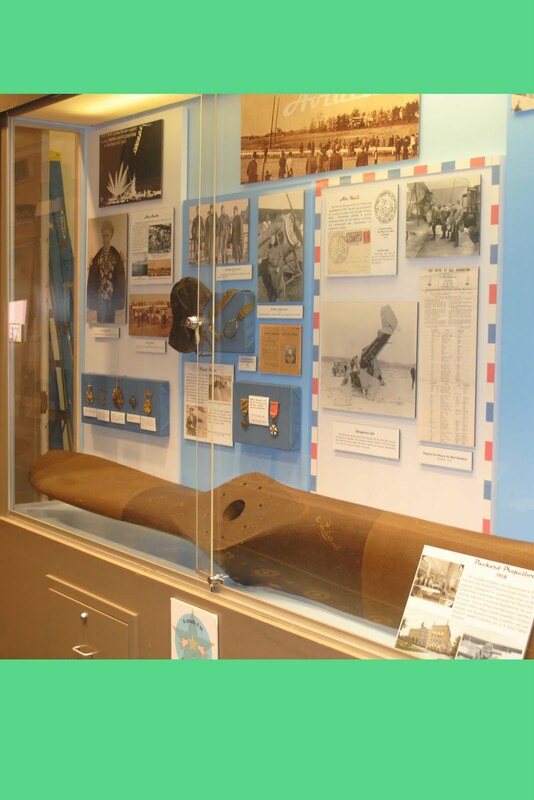 Follow that with a drive up to Smith Field or south to Fort Wayne International Airport to learn more about the history of aviation in Fort Wayne. It will be a great day for the family. Fort Wayne International’s Aviation Museum is open for private tours by calling Judy Lake, volunteer coordinator, at 747-4146. Myers was Delta station manager at FWIA for 44 years and served in WWII as a bombardier.